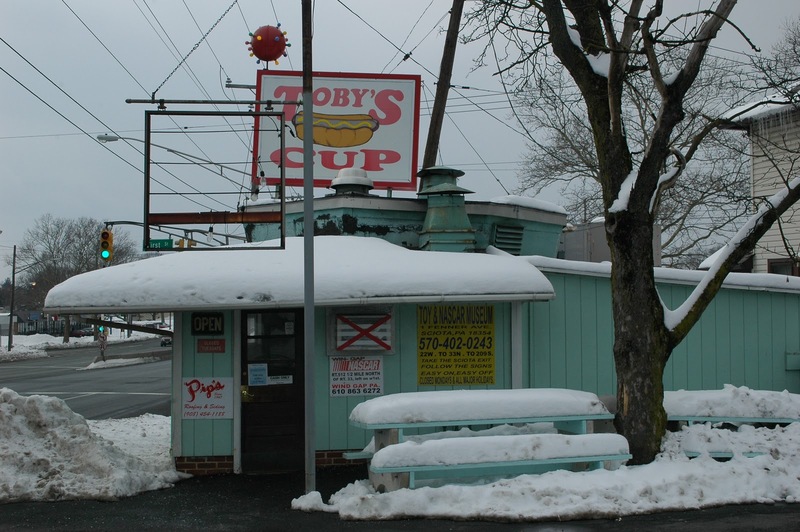 One of the highlights of the serendipitous Phillipsburg trip was a visit to one of Route 22's quintessential road food establishments: Toby's Cup. It's long been on my list of destinations, but for whatever reason, it took till now (and, I guess, the participation of a road trip partner) to get there. This is one of those places where it's not so much about the food itself as the experience. In fact, it's the kind of eating establishments that separate the cool people from the snobs on sites like Yelp and Urban Spoon. If you're deriding the place for how disgusting it is, you just don't get it. The Cup, eastern exposure, as seen from the parking lot. I wasn't fully prepared for the maneuver you have to take if you're going to get into Toby's tiny parking lot, but having learned how to drive on 22 in Union County, I knew what must be done. On the second pass, I rapidly decelerated from highway speed to about five miles an hour to make the sharp right turn, and be ready to grab the spot closest to the road, all without starting a chain collision behind you. Basically, without experience knowing where the place is, you're going to have to do the second pass, anyway: the whole shack is probably less than 100 square feet in size. Blink and you'll miss it. Upon our visit, there were already five or six people standing in the cramped customer standing area, waiting for their orders to be called. As Ivan noted, you'd need to go outside to change your mind. Fortunately, we were the only ones who hadn't put in an order, so the counterman took our requests pretty quickly from behind a plywood countertop that also held Tootsie Rolls (2 cents per) and Tastykake fruit pies. 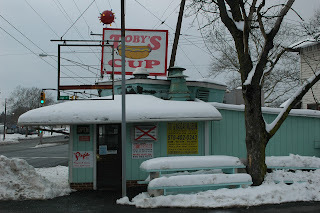 There's not a whole lot on the menu; hot dogs, hamburgers, cheese steaks, and, interestingly, a variety of shake options. Soda comes in cans, and chips are available instead of fries. Fair enough. As we waited for our order, the crowd thinned out and we were able to take a look at the stuff posted on the wall next to the counter window. If you wanted your hair cut, or an old train set, or your driveway plowed in the Lopatcong area, this apparently was the place to find your source. It didn't take long until we had our bag of food and were back out to the car to eat. The dog wasn't bad -- they fry them in oil much like Rutt's Hut, and that's not especially my favorite way of having them, but it was okay and the skin gave a nice snap when I bit into it. Ivan's hamburger was reminiscent of what I used to get at my grade school cafeteria: vaguely gray meat with a taste you can't quite put your finger on, except to say that it definitely isn't 100 percent beef. Nothing a little ketchup and mustard can't remedy. And, of course, you can't put a price on the experience of reliving your childhood through meat of questionable origin. Would I go back again? Yes, if I was in the area. I'd opt for a second dog (at 75 cents a pop, they're a bargain anyway) and check out one of those shakes. Plus, I want to see how many people could possibly fit into that phone booth they call a counter area.